First, let's import the PyTables module, then open up the file (available from http://labrosa.ee.columbia.edu/millionsong/sites/default/files/AdditionalFiles/msd_summary_file.h5). Let's see what the file's structure is like. We want to find songs in each year (/musicbrainz/songs/year) and to retrieve the BPM (/analysis/songs/tempo) for each one. A little sparse before 1953, but we'l take it. Now let's see what the trend is (if any). We'll fit a LOWESS curve, then plot both it and the raw means. Lowess smoother: Robust locally weighted regression. The lowess function fits a nonparametric regression curve to a scatterplot. the estimated (smooth) values of y.
function will run faster with a smaller number of iterations.""" 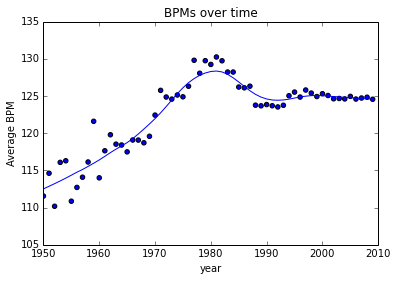 The tendency seems to have been a gradual increase since the '50s (when the data goes over 100 samples), peaking at 130 BPM in 1981 and settling around 124 BPM. Of course, these numbers should be treated with some skepticism, as 1993-2009 are significantly overrepresented in the corpus.